You must be a member of the Rome Unearthed Group to attend this activity. Would you like to join this group? After all the fun we had in Pompeii last year, come and join us for a visit to Herculaeum on the free museum Sunday in April. 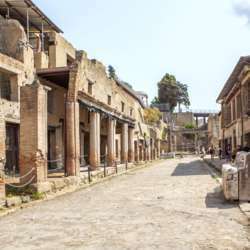 Herculaneum is less famous than Pompeii and much smaller (well that may not be true, but most of it is still buried under the modern town that was built on top of it! ), but it’s impressive in a different way. While Pompeii was hit by ash and rock, Herculaneum was buried under lava, which preserved more of the buildings, including organic materials like doors. Herculaneum was also a richer town than Pompeii, so the buildings we can visit are often larger and more ornate. At the moment, the best option for the train is the Italo day return which is €40. There may be better offers closer to the time, but the tickets may also sell out, which is why we’re posting this early! Once you have bought your ticket, please leave a message below to confirm that you are coming. Please note that the tour will be in English.